This is the third and final part of a series of posts on issues in museums that I thought warranted a bit of unpacking. In the first post, I looked at “immersion” and at “experience” and “participation” in the second. I wanted to understand more about visitor picture taking in museums and this is the result. There’s a lot of rhetoric expended on condemning or extolling the practice, but not as much trying to get at why people take out the camera and click in a museum. In this super-long post, which I beg your forgiveness for not making shorter or breaking into pieces, I want to explore the positions of the pro and anti visitor photography lobbies, make some observations and then look at the underlying motivations. In the end, I’ll propose that digital souvenirs are just the latest way people in museums memorialize the event, and that the social act of sharing images is an act of affiliation and affection that should be encouraged. 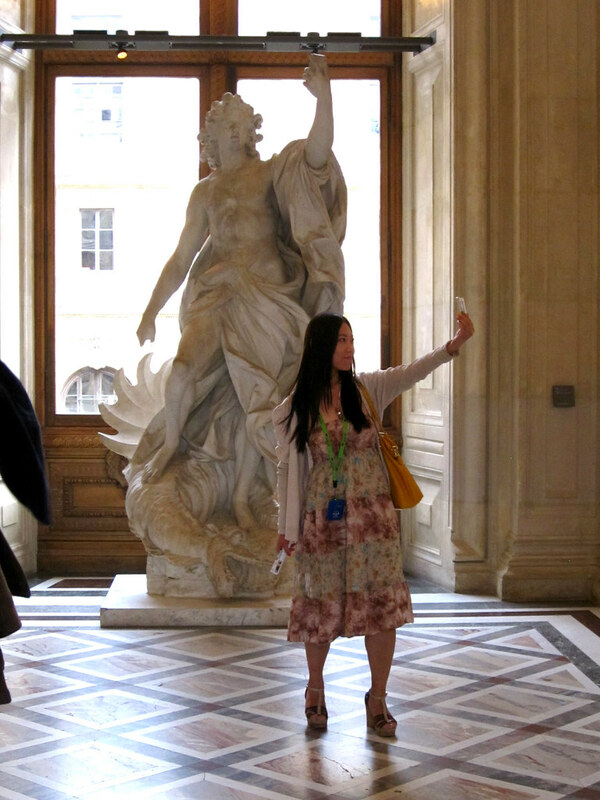 Part One: Visitors taking pictures in museums: curse or the reverse? Let’s get this out of the way first. Yes, I’ve been to the Louvre and seen the mobs with their phones out, clicking away while this modest little panel painting sits behind it’s acrylic shield, railing, and stanchions, looking a bit lost. Yes, it makes me nuts, as it does almost all of the people who’ve written about how bad photography is. It’s Exhibit A in every formulation of the anti-photography case. However using the most well-known painting in the world as a case study for why photography should be banned is a bit problematic. The rules are just different when you’re Mona Lisa. 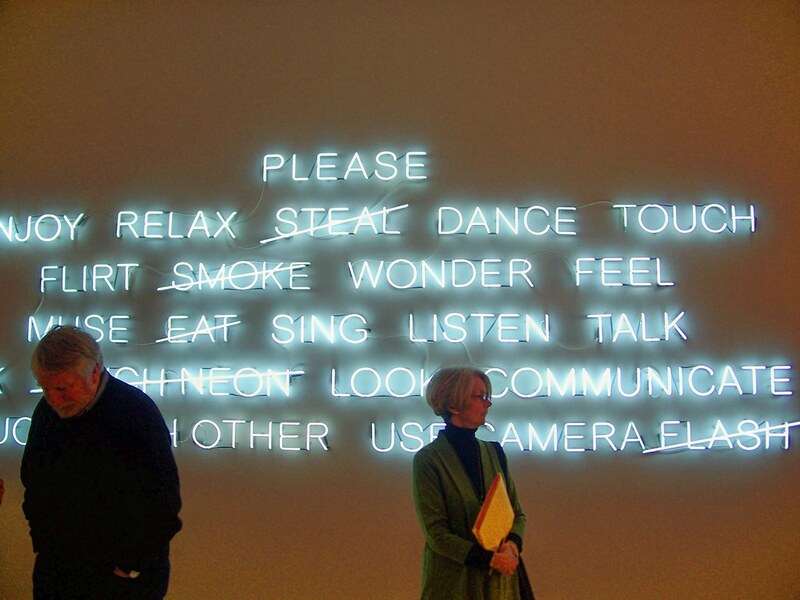 So in this age of ubiquitous digital cameras, what should museums say to visitors when it comes to talking pictures? Ban it? Encourage it? Finesse it? A steady chorus of voices suggest that banning photography is the answer. Damn those people with their phones! “These tourist snappers are killing the Mona Lisa “ written by Jonathan Jones for The Guardian is typical of educated people’s problems with photographers in museums. Flashes ruin the experience, crowds make it impossible to actually experience the painting. And the people who feel obliged to behave this way? For Jones, they’re “a crowd of idiots behaving grotesquely.” It’s tacky, and you shouldn’t want to part of that group whom sensible people despise. Travel blogger The Everywhereist wrote a post called, “Ten reasons why you shouldn’t take photos in museums” that are an interesting mix of snobbery, concern, and lack of understanding of how museums work. The largest group of reasons have to do with cultural norms and not obeying them. Being the dope with their camera out is tacky. Cameras turn museums into tourist traps, instead of places of reflection. Picture taking causes congestion. All of these, if viewed through the lens of creating a flow experience, can be seen to be factors that would interfere with feeling of immersion someone who seeks a passive viewing experience craves. Several have to do with the supposed reasons people take snapshots in museums and why that’s isn’t appropriate. People who take pictures won’t actually see the art. She asserts that the photos will be pointless, assuming that the point is to get an accurate high-quality representation of the work. The last few are actually amusing, considering she illustrates her post with photographs she admits taking in museums. Photographers steal desperately needed money from the museum because if photography weren’t allowed, all these people would go to the gift shop and buy a postcard of the images they were interested in. The Met’s postcard section must be the size of an Amazon warehouse to hold all those postcards of everything on display, huh? Further, photographers hurt artists, who might otherwise get a cut of the proceeds. And of course, flash photography hurts the paintings. More on this later. What I like about this post is the way it dispenses with the kind of highbrow rhetoric that often gets deployed in these situations. In short, photography is not the problem. Other people taking pictures is the problem. 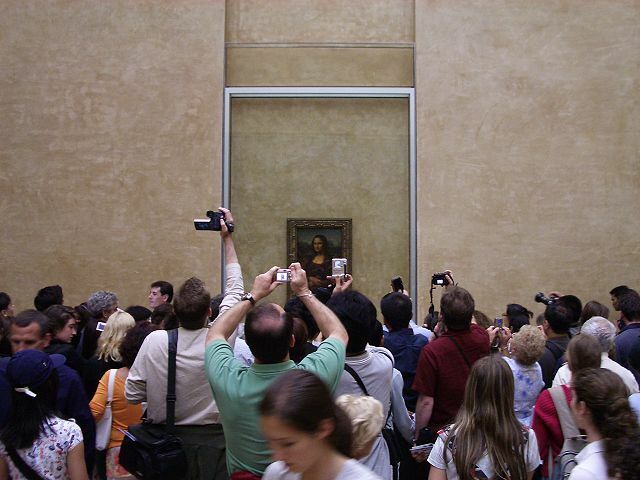 Mark Dubovoy, writing for the photography blog The Luminous Landscape, wonders “Are Museums Destroying Art?” when allowing visitors to bombard the Mona Lisa with flashes. He goes into greater depth about the evils of flash photgraphy, but the meat of his piece comes later. He feels that museums that allow photography are destroying art by eliminating the appreciation of the original objects. According to Dubovoy, “the vast majority of people inside these museums are after the trophy shot with their face in front of a museum piece. They do not look at the originals, they do not care. They do not contemplate them. They are not interested in understanding them or experiencing the message. They do not cherish them.” That’s pretty clear. People who take pictures are bad, and don’t deserve to spoil the experience of the those who really care about art. The most extreme formulation of this position is in a nice piece Eric Gibson recently published in The New Criterion called “The overexposed museum”. He sums up most of the arguments against letting visitors use cameras, and indulges in some awesome hyperbole, to boot. After setting up the Mona Lisa scenario again, he claims that the “museum that allows the indiscriminate use of smartphones and tablets in its galleries is one that has lost control of its collections. The first casualty is the art experience itself.” Wow. It gets better, though. According to Gibson, letting people photograph can’t even coexist with other ways of looking. “The new culture of museum photography banishes the art experience. It transforms the work of art from something to pause before, explore, admire, and reflect upon, into a “sight,” like the Eiffel Tower or the White House. A fascinating, complex, multi-faceted product of the creative imagination becomes just a piece of scenery”. I won’t get into why architecture doesn’t count as art. Others feel differently about photography. Art critic Deborah Solomon, when she’s not getting in trouble with Norman Rockwell’s family, thinks that photography ain’t such a bad thing. Her New York Times opinion piece, “Hey ‘Starry Night,’ Say ‘Cheese!’” is an excellent counterpoint to Gibson, and offers a more nuanced appraisal of visitor photographers. Rather than pretend that everyone who takes a picture is the same, Solomon distinguishes between the annoying “click and move on” visitor, the gallery cloggers, and the rest of us. After name-checking Benjamin, she reckons that the inevitability of visitor picture taking renders museum bans on picture-taking virtually unenforceable. More than that, she thinks picture taking enhances the experience of looking at art. For Solomon, even the most casual photographer is engaging, the basic mission of visual art: to celebrate the act of looking. Looking through a lens forces you to take note of composition, light and shadow and all the other artistic considerations needed to make a picture come out. The camera is a means to learn how to look. For support, she quotes photographer Dorothea Lange, “The camera is an instrument that teaches people how to see without a camera.” So taking pictures is actually giving visitors practice thinking like an artist. And for the non-obnoxious photographers, photographs function as art postcards used to in the last century, when museum stores actually carried large quantities of them. So, these digital souvenirs are actually helping visitors appreciate art. I say hooray. When we photograph, e-mail, tweet and Instagram paintings, we capitalize on technological innovation to expand familiarity with an ancient form. So, too, we increase the visual literacy of this country. Much can be gained. Nothing can be lost. A photograph of a painting can no more destroy a masterpiece than it can create one. Carolina Miranda asked recently in ARTNews “Why Can’t We Take Pictures in Art Museums?”, and compiled an really interesting assemblage of responses from museums that are attempting to be more responsive in their policies. She comes up with a slightly different set of reasons than most other open-photography advocates. In these days of social media, museums are sharing more and more content, a lot of which is imagery. The message sent out by a museum that wants you to like their Facebook page full of images, but doesn’t want you taking the same kinds of pictures, is confusing, to say the least to visitors. Enforcing no photography policies is taking up more and more time of gallery staff and guards who actually have a more important mission, safeguarding the objects on display. And asking these typically not well-paid hourly workers to make fine distinctions like “Is that person taking a picture, or looking something up on line, or texting?” is unreasonable. The other issue Miranda unmasks is probably the biggest; the knotty, hard to explain issue of copyright. It’s something art museums generally avoid talking about, much to our detriment. A museum visitor might reasonably expect that a museum displaying an object had the right to let them photograph it or not. The reality, is far more complicated than that, but museum generally avoid getting into the details with our audiences. Living artists have legitimate claims to their intellectual property that art museums must safeguard. However, common sense would seem to indicate that the overwhelming majority of photographs taken by museum visitors are completely noncommercial. Copyright laws, which largely date from the pre-digital era when access to scarce resources was the norm, have a hard time accommodating the reality of digital abundance, and even the copyright lawyer quoted in her article say visitor photographs could be considered infringing and potentially violate copyright. When the experts don’t know, how is the public supposed to? Visitor photography = living up the mission to share culture. As long as it does not promote unsafe conditions for artifacts or people or illegal behavior, museums should prioritize providing opportunities for visitors to engage in ways that are familiar and comfortable to them. Restrictive policies erode staff/visitor relations and overall museum mission statements around inclusion. 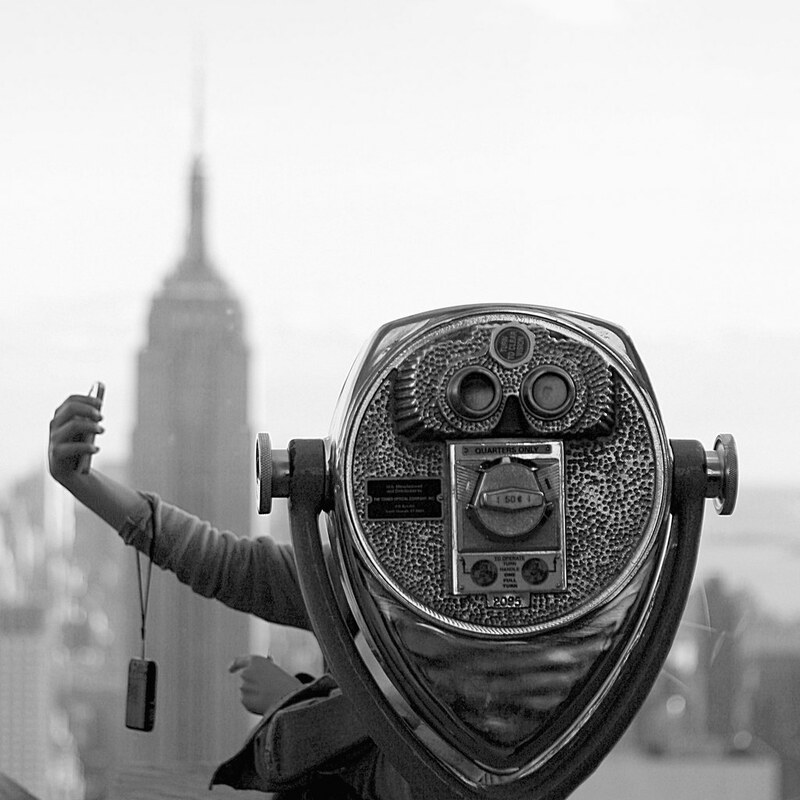 Photo-taking allows visitors to memorialize and make meaning from museum experiences. When people share their photos of your museum, they promote and spread your content to new audiences in authentic ways. Encouraging visitor photography is one way to walk the walk of your museum’s mission. You can’t stop it anyway, so if you can’t beat ’em, join ’em. Part Two: So what to make of these competing contentions? It disrupts the experience of others. Of all the reasons given, this one has the most merit and is an ongoing problem, in certain instances, like big traveling shows, at the largest art museums, and with a select subset of high-profile objects. The unspoken contract between art museum and art museum visitor was that the museum would provide an environment to display art in a particular way to encourage focused concentration on a single object at a time, and that the visitor would quietly and reverentially gaze at objects. Adding photography to that mix breaks that contract. It’s not quiet, it often provokes social behaviors, and flashes exacerbate the condition. Part One of the this series has really made me check my own sense of privilege as a professional and examine why it’s OK for some people to dictate how everyone has to “do” a museum. The fact that I’m philosophically aligned with one faction doesn’t make it right. The people who come to museums for a quiet, passive, contemplative (dare I say spiritual?) encounter with the products of human creativity have just as much right to their kind of experience as the people who come in noisy groups looking to kill an afternoon in the presence of the unique and rare. The solution seems to me to be to establish a new contract, and actually state it, instead of hoping that visitors will infer intent. I’d love to see museums generate explicit policies that state what the museum encourage, allows, forbids, and why. I love the way this piece near the entrance in the MFA set up visitor expectations in a way that is at once playful and establishes the kinds of behaviors the museum encourages. I used to have no patience with this contention since it so often came wrapped in such barely disguised condescension that I’d have to fight down my gag reflex just to finish reading. I think this is an offshoot of the point above, and the misguided assumption of some commentators that there is one right way to “do” a museum, and that’s their way – quietly and without anybody else getting in their way, please. I have no solution for this, other than limiting access to spaces. Or maybe a test of worthiness to enter a given museum. Underlying this contention is the assumption that if only people weren’t looking at their cameras, they’d spend more time looking at the art, and I don’t buy it. Solomon was right when she segmented the photographing audience. Their are some people who might use the time they weren’t taking pictures looking at the objects. They are just as likely to fly through the museum at the same speed, and not look any more deeply. The solution I think is to spend more effort exploring ways of approaching art, so that more people can have more intellectual access to our objects. That’s the educator in me sneaking out, and I realize that this “solution” immediately runs afoul of the anti-interpretation folks who grudgingly put up with minute, invisible labels, but long for museums completely devoid of labels. The solution is simple. Ask people not to use flashes. I’ve always disliked this contention, because it’s such a defeatist way of approaching our work. There are museums like the Orangerie, which completely bans photography. It can be done. Photos will still be taken, they’ll just be surreptitious and you’ll spend a lot of effort on policing the peopel you depend on for your existence. The solution seems to be to have a good reason for your photo policy and state it. This is another one the I have trouble with. I think photographing objects has the potential to encourage looking at the art, but it’s dependent on the person and the context. It is no more a guarantee of greater engagement than it is a sign of lesser engagement. The solution? 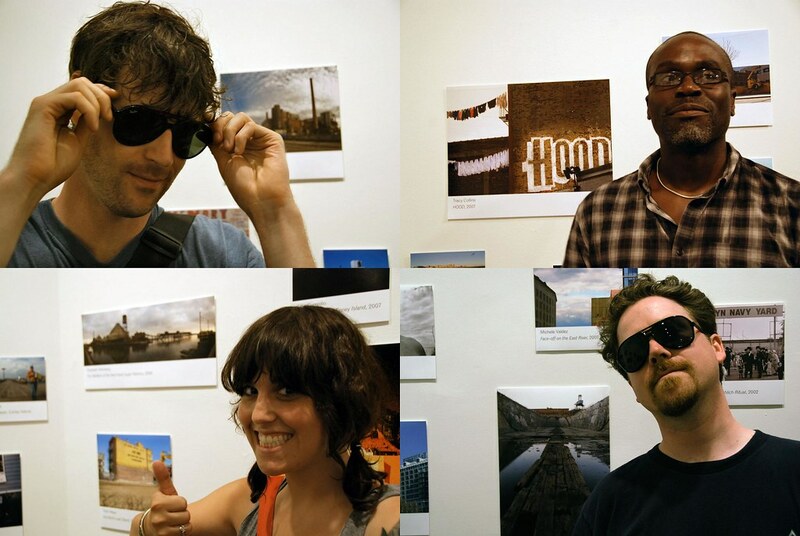 Come up with programs on photographing in the museum and see how visitors react. Do they engage more deeply? Let me know what you find out, OK? What about making it part of the museum’s practice? One interesting response to visitor photography has been museums’ attempts to harness this urge for mutual benefit. Museums have dipped their toes in the waters of encouraging visitors to photograph the museum and make homes for these images, lending a bit of the institutional imprimatur to amateur images. Examples are numerous, from the Brooklyn Museum’s Click!, to the Carnegie Museum’s Oh Snap!, CCCB’s Branguli exhibition, and many more (might be a good blog post for someone to round up all the visitor photography shows.) The Melbourne Museum’s Melbourne Story is a good example. In their Visitors’ Photo Album, you can see visitor photographs that have been uploaded to Flickr where you can join the Melbourne Stories group and add your own pictures to the collection. “When a work of art becomes fetishized,” the affable, articulate artist points out, “it dies.” Struth feels the paintings in his museum photographs regain aspects of their original vitality when seen anew in the context he renders so seamlessly. Since so many of the arguments against photography posit it as an inappropriate thing to do during a museum visit, I think it’s worth poking at what is appropraite and why. The obligatory quotes from German philosophers follow, so you know I’m serious. For Adorno, the whole museum endeavor is fraught. In the “Valéry Proust Museum” he claims that the word “museum-like”, “describes objects to which the observer no longer has a vital relationship and which are in the process of dying. … Museum and mausoleum are connected by more than phonetic association. Museums are like the family sepulchres of works of art.” This dissociation is as present today as it was then. The struggle to establish relevance and connection is one museum educators wrestle with daily. On the one hand, the manufactured context of the art museum provides a unique setting. There is nowhere else in our daily lives where we can go to have the same kind of experience. On the other hand, this artificial construct, what Adorno calls “the authoritarian gesture”, chafes. The shushing guard, the “No ______” signs, the admission fee, and the interpretation that may (or more often may not) be written for a lay audience, all conspire to create an environment where the power balannce is clearly all in the museum’s favor. And as I blogged about a few months ago, this power relationship is central to the real issue behind photographers. Who has the right to express their creativity in the galleries, and who should keep quiet and adopt an appropriately reverential (and deferential) pose? So why do people take pictures in museums? As I said earlier, I think the photo-skeptics make several false assumptions when they talk about the motivations of visitors who take pictures. I don’t think most people who take photographs of objects in museums do so in order to document that object in the way that a professional tries to document an object with as much fidelity as possible in order to make a permanent record of that object. Were that the case, then the obvious answer would be for visitors to go to the museum’s website and hope that the object of their curiosity was part of that tiny minority of objects that most museums have photographed in suitably high resolution. In a world of social media, museum photograph, even selfies, now serve as a form of affiliation. By posting their pictures, visitors are associating themselves with the museums they were in, just by sharing their photos. And I think this is underutilized and under-appreciated by us. They proclaim “I was here!” and they’re not doing that at the cinema, or supermarket. So… you made it to the end! I’d love to hear your thoughts, and I swear I’ll be more succinct next post. This has gestated for a couple of months and continued to accrete references like a snowball rolling down a hill. I think it’s interesting that other visitors seem to prioritise the views of the camera users over those who are “just looking”. Like you, I don’t think this is a reason to ban photography. But it’s an interesting phenomenon nonetheless. Thanks for presenting both sides of this issue in this lengthy piece! When I worked as a volunteer docent some years ago, my training had consisted of learning innovative ways to encourage museum goers to spend more time actually looking at works of art. I’ll admit to having had something of a negative response to visitors clicking away. But when I became a grad student in Art History I started to take photos of artworks (and their labels or frames) in museums as a future reference aide–for scale, or, to remember a curatorial setting I might have liked, to link a work of an artist for comparative analysis with another painting elsewhere, or to highlight minute details on certain canvases. I try to do this in an unobtrusive way and have to smile to myself, now, when I see museum staff giving me disapproving looks. I think there’s an critical examination of the presentation of objects that needs to be part of this discission, especially in relation to the dubious assertion that casual photography of art prevents actual “seeing” of the art. If the Mona Lisa is a favorite example of this lobby, let’s look at that. The Louvre has taken a monstrously famous, but modestly sized painting and presented it behind multiple layers of protective barriers in a space that is designed to allow the maximum number of people to get a glimpse of the work as possible. Even without snapping cellphones, can anyone “see” the work anyway? It also strikes me that museums could take advantage of the debate over whether or not people are “communing” properly with the art by setting aside certain hours for their premier galleries in which there would be limited attendance, a request for quiet and no photography allowed. For an added fee, of course. Wow, bravo, Ed! I’d be interested to hear opinions on the subject from emerging professionals like myself (who are apparently part of the “selfie generation? ugh) and what they think of the issue. Personally, I think allowing photography is a way of engaging with visitors, and I’ve seen some great examples of it, particularly through Instagram. The MFA has contests on their Instagram feed, and they choose their favorites, I can’t remember if it’s every day or every week. I recently saw (on Instagram) that the Cal Academy of Sciences has a “Reindeer Selfie” spot in their new ‘Tis the Season for Science exhibit, and they encourage visitors to post the selfies taken at the exhibit to their Facebook, Instagram, or Twitter feed, with the hashtags #reindeerselfie and #calacademy. I think if you’re polite and not disturbing the experience for others while taking your photos, then photography should be an acceptable practice in museums. But I definitely also have felt annoyed at people who crowd around a work with their Nikon D-SLR with the flash attached to take near-professional quality photos of a painting. I remember not enjoying the last Sargent show that came to the MFA (not the watercolor one that is there now) because there were so many visitors surrounding pieces like ‘Madame X’ that it made the experience totally underwhelming. Same with the Harry Potter exhibit at the Museum of Science. I guess what I’m saying is that there is a fine line to be walked when it comes to acceptable photography practices in museum spaces. This was such a great post, I’m definitely going to share it with others and see what they think! Thanks for this arficle presenting both sides of the debate. Well done! Oddly enough, I had just rectnently come across this article that found people were less likely to remember if they took a photo http://www.businessinsider.com/taking-photos-may-harm-our-ability-to-make-memories-study-2013-12 I think it depends on the context. Is it a hastily taken “I was here” photo, in which case the photographer may have not really looked at the art, or a carefully framed composition? Also, art museums can be a little over zealous, stopping people from taking images of labels or signs when there isn’t even art in the photo. Thanks for your thoughts. It’s funny how sometimes a blog post will spend ages stuck in my head or half-done on my computer, and then once it’s out, a slew of new material relating to it will come out. I’ll post an addendum of four more articles, including the ones you’ve brought up. Thanks! Thanks, Sheila. This was one of the ones I’m planning on adding! Shelia, I was also going to comment about the recent Psychological Science article. In all three conditions, whether taking a photograph, taking a detailed photograph, or just observing, participants were prompted to pay close attention to the object, so it seems to be a more powerful effect than even just the “I was here” intention. It was also interesting how taking a detail shot photograph helped visitors remember more details overall than taking the full-view shot. This seems to reenforce the usefulness of framing that museums can give visitors, if they are encouraging photography. Just a quick correction — I work at Carnegie Museum of Art (where the “Oh, Snap!” exhibition took place, and that photograph illustrating people with their photos is actually *not* from that exhibition. Fantastic article. One possible typo: ‘It can be down’ should maybe be ‘It can be done’. OK, the Linda Henkel’s article has generated a lot of interest and is worth a read. My immediate reaction to the headline takeaway, which is “Aha! Proof that phones are bad!”, is a “Not so fast, buckos!” If you read about the study, you’ll see that subjects were *told* what to look at and photograph; in other words, the exact opposite of free-choice learning that happens in museums. The other interesting tidbit was that when they were told to zoom in on a feature and photograph it, they remembered *more* than those who just looked. It’s a fascinating study, so give it a look. I think we need to develop post visit interviews for this as a study. It would be really interesting to see what people would say if they hadn’t been prompted to do specific things. Also interesting would be to do exit interviews with people who didn’t photograph. This might provide information on ‘free-choice learning. In case this sounds like I’m building an anti photograph case, I’m not. I’m just really interested in the visitor experience and this is fascinating. Thanks for summarizing the literature on this hot topic and for sharing your thoughts about the various arguments. A very stimulating post! Glad to be of use! I’ll be interested to see how the evaluation field parses Henkel’s study. This is a fascinating article about the controversies surrounding taking photographs in museums, particularly art ones. I will refrain from my own personal views, but I will say I agree with almost all of the author’s assertions. What are your thoughts? Hi Ed…as a lurker on this series, which I discovered initially to your reference to our work on the “Spreadable Media” project, I found this discussion fascinating. It deals with issues I’m exploring more broadly when it comes to immersion in media texts, participation and experience with media, and content created by audiences…but shows how the discussion can take on such a different flavor from “world” to “world.” You’ve presented here, for an “outsider” to this space, a very helpful perspective on the issue. I am a huge fan of xkcd. Thanks for the link. Thanks for the great post! I appreciated your well articulated thoughts in all three parts. Although my own post on visitors and photographs is not nearly as in-depth as yours, you might enjoy reading some of my thoughts…http://bubbleplan.tumblr.com/post/63403577987/photo-ops-audience-engagement Thanks for the great blog, Ed! Thanks, Clare! And thanks for the link to the Anne Midgette piece in the Post.